Did you know all this stuff about the jolly old elf? Five more days to Christmas. We don’t expect snow, but it sure has been cold lately. Glad you could stop by and have coffee with me this morning. "C'mon Son," the screener wrote on the TSA "Notice of Baggage Inspection" on Wednesday, when the rapper flew to Denver to perform. Gibbs, who has publicly expressed his love of the green bud, tweeted a photo of the notice and two bags of weed. "The TSA found my weed and let me keep it. They just left me a note," he told his followers, ending with "Lol." 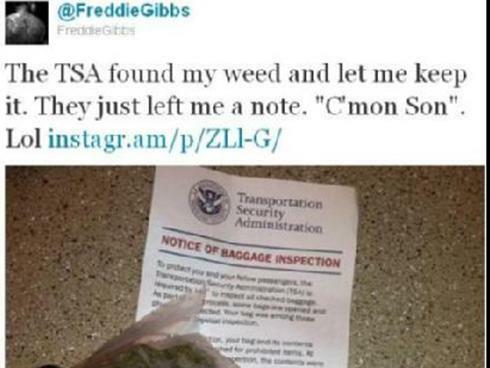 Gibbs has since deleted the tweet, which several folks pointed out incriminated him for illegally transporting a controlled substance and that might get the TSA agent fired. A TSA spokesman told The Hill that airport security workers are supposed to notify police when illegal items are found. It's been 30 years since gasoline took such a big bite out of the family budget. When the gifts from Grandma are unloaded and holiday travel is over, the typical American household will have spent $4,155 filling up this year, a record. That is 8.4 percent of what the median family takes in, the highest share since 1981.Gas averaged more than $3.50 a gallon this year, another unfortunate record. And next year isn't likely to bring relief.